Key Difference: The terms are interchangeable and can be used to refer to the swelling under the eyes. However, in technical terms, there is a difference in the way the terms are used. Eye bags refers to slight swelling or minor puffiness. They are usually visible only under the eyes, but may be present all around the eyes as well. Eye puffiness is usually used to refer to an exacerbated condition, where the puffiness in much worse. It often happens that the skin around the eyes tends to look puffy and become noticeable. While harmless in most cases, it is often looked down upon as it does not meet society’s beauty standards. This is often referred to as puffiness or eye bags. The terms are interchangeable and can be used to refer to the swelling under the eyes. However, in technical terms, there is a difference in the way the terms are used. Eye bags refers to slight swelling or minor puffiness. They are usually visible only under the eyes, but may be present all around the eyes as well. Eye puffiness is usually used to refer to an exacerbated condition, where the puffiness in much worse. Here the swelling is very prominent and is often located all around the eyes, but maybe more visible under the eyes. In most cases, the swelling is caused by aging. As we age, the skin and muscles tend to get weaker. The skin and muscles around the eyes tend to hold a layer of fat around the eye which tends to protect the eye. However, as the skin and muscles get weaker, the fat tends to slide downward with the help of gravity. It tends to collect under the eye causing the swelling around the eye. This fat is then targeted by fluid which causes the fat cells to swell, thus making the puffiness more prominent. Additionally, as the skin ages it also tends to become more translucent thus allowing these bags to be more visible that they would have otherwise been. 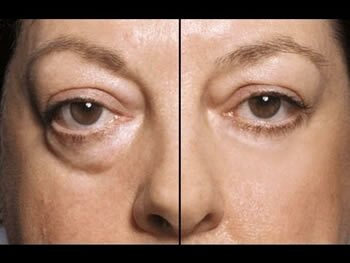 There are also a number of other factors that make the eye bags more prominent. Tiredness, fatigue, and lack of sleep are a primary factor that may also lead to eye puffiness or eye bags. Allergies or a high sodium diet may also lead to the development of eye bags or puffiness. The presence of eye puffiness and eye bags can also be exacerbated by a poor skin care routine, as the lack of care can lead to the breakdown of the skin cells which may in turn allow the fat to slide and collect under the eyes. However, it should be noted that if the eye bags are severely pronounced and are accompanied by a deep dark strip of hollow skin underneath them, it could be a sign of an early warning sign of either thyroid problems, or adrenal fatigue. In which case, a doctor should be consulted. One should also see a doctor if the swelling is severe and persistent or is accompanied by redness, itching or pain. It is also a cause for concern if the swelling affects other parts of the body as well, such as the legs or arms. In most cases, the eye bags and puffiness are harmless and not a cause for concern. However, if one does want to get rid of them, then there are medical treatments available which include either a surgery to remove the excess fat, or a treatment that tighten the skin to hold the fat in place. One can also utilize various home remedies to treat the eye puffiness and eye bags such as keeping the area cool, or massaging the area to allow for the fluid to drain. A quick temporary fix is to use makeup and concealer to hide both the eye bags and the puffiness. The appearance of swelling in the tissues around the eyes, called the orbits.